There are about 100 different cat noises, which our feline friends mix and match to talk to us. 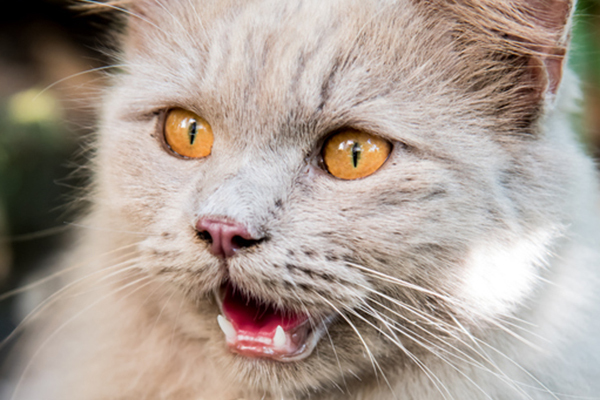 Let’s review some of the most common cat noises here. You’ve probably noticed that cats spend a lot of time and energy communicating with other cats in their lives, but that very little of that communication is in the form of cats meowing. If they talked as much as they gestured (case in point: when cats rub against you), the odds are good that you’d wish they’d just shut up. Of course, because most humans aren’t nearly as good at observing body language and understanding cat communication like subtle cat ear movements and cat tail twitches, they often “use their words” to help us understand these cat noises. Cat meowing – Kittens are much more likely to meow than adult cats. Because kittens are born unable to hear and see, they meow to alert their mother that they need attention. So, why is your adult cat making these cat noises? Adult cats rarely meow at each other, but they may meow at us for the same reasons. (Humans sometimes meow at each other, but it’s usually for laughs.) Check out this kitten crying for her mother. Cat purring – Purring is one of the most common cat noises. Cats purr when they’re content, but they also purr as a way to comfort themselves when they’re sick or injured. The auditory frequency of the purr, around 25 cycles per second, is thought to have healing properties, and it almost certainly acts as an internal massage. Cat trilling – Cats use a trill, a cat noise somewhere between a meow and purr, as a friendly greeting. This cutie is meowing and trilling to beat the band! Photography by ©Foonia | Getty Images. 5. Cat chattering – If your cat sits in the window staring at squirrels outside, ears erect and eyes focused, but he can’t get outside to chase them, he may make a cat chattering or cat chirping noise. These cat noises communicate either excitement or frustration. 6. Cat hissing – Cat hissing is among the cat noises you may hear when your cat is angry or scared. The hiss is the next stage of warning after the growl. 7. Cat yowling – Female cats in heat make this desperate cry, hoping to attract tomcats to ease their pangs of kitten-making desire. And cat screaming, a variant of cat yowling, is the final warning sound before a serious cat fight begins. 10. Cat wailing – I feed my Bella in the bathroom with the door closed, because if I don’t do that, she wolfs down her food and then steals Siouxsie and Thomas’ meals as well. Usually she finishes before the other cats and then starts in with her heart-rending cries of “Pleeeease, let me out!” “Just a minute, Bella,” I reply. Of course, I do let her out once the other cats are finished eating. 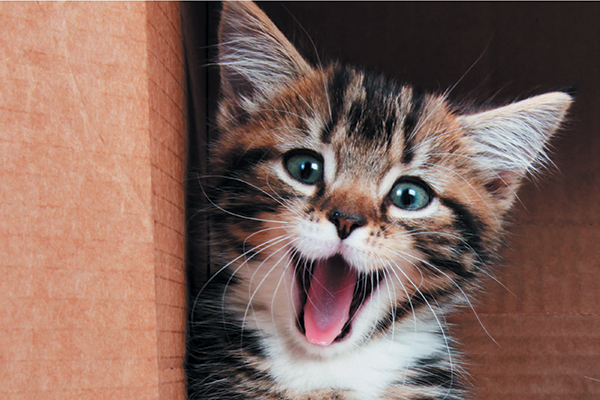 Tell us: What are your favorite cat noises? Did we miss any cat noises that you would like to know more about? Please share your favorite cat noises in the comments! Thumbnail: Photography ©graphixchon | Thinkstock.